We had an amazing time on our recent Curacao vacation but the change in weather and strong sun there really did a number on my skin. Upon our return, my face looked dull and tired and the sun totally aggravated the appearance of my freckles and gifted me with some unwanted sunspots. Fortunately I had this Exuviance Firm-NG6 Non-Acid Peel waiting for me to try when we got home and it was just what I needed. This product comes from the company that created the original Glycolic Acid Peel and it is formulated as a safe, acid-free formula that is gentle enough for all skin types. I've used a number of different glycolic acid peels before and they're great for cell renewal which improves the look of fine lines and wrinkles, skin texture while evening out discolorations. 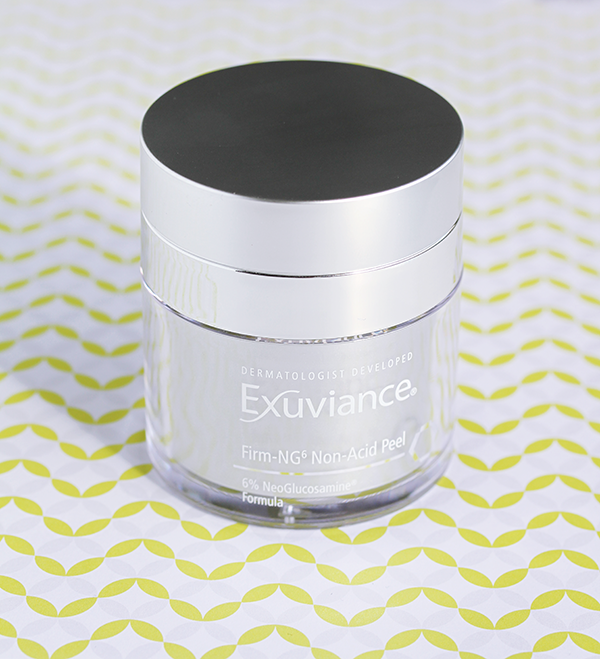 Product Claims: New Exuviance Firm-NG6 Non-Acid Peel is formulated with NeoGlucosamine to increase cell turnover and exfoliation for all the benefits of a peel with the potential for irritation. More than just your average peel, this leave-on, no-rinse formula, appropriate for all skin types, plumps skin matrix to increase volume and helps firm and tighten skin while exfoliating to reduce pigment and brighten skin. Key Ingredients: A a 6% concentration of NeoGlucosamine, which facilitates cell renewal and exfoliation to plump skin. NeoGlucosamine is a neutral, non-acid amino sugar found naturally in the skin with similar benefits as AHAs. It exfoliates while helping to build the skin’s matrix to increase volume and reduces pigment to brighten skin. Packaging: A sleek plastic jar with pump dispenser inside. I really wish more jarred products would be packaged like this since it's hygienic and also effectively preserves the integrity of the product. Price: $68 for 1.7 fl oz. Currently on sale for $51 on the brand's website. My Thoughts: The peel itself is a clear gel with a thick and slightly tacky texture and a non-distinct scent. Following instructions, I've been applying it after washing my face in the evening and waiting for about 10 minutes to allow for it to fully absorb before applying my moisturizer. The first morning after trying it, my skin appeared so smooth and refreshed when I woke up that I almost couldn't believe it. I continued using it for the next few days and while the results weren't quite as astonishing as the initial application, my skin was so soft and I could see a visible difference and the sunspots that had popped up on my face had already lightened. As remarkably effective as it has been, I've also been impressed with it's incredible gentleness and I'm happy to report that I haven't experienced any redness of irritation or burning. Has anyone tried those old school peels? There would literally be like a tingling, burning sensation with some of them because of the acid. I was also concerned about dryness and it was a non-issue. I'm now using this peel 2 - 3x week and I skip my usual essence and serums when I do. This product is supposed to be safe enough for daily use but I do other treatments as well so that's good enough for me. The innovation of this peel along with it's efficacy gives it place among my trusted skincare arsenal. I really like how it's smoothed and boosted the radiance of my skin. 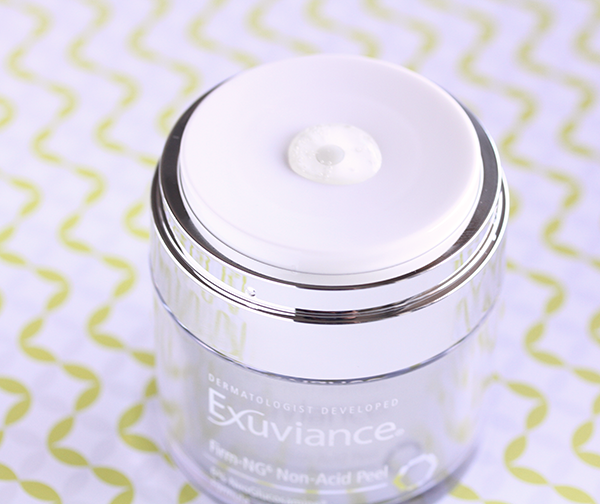 Exuviance Firm-NG6 Non-Acid Peel is available for sale through the Neostrata website as well as Ulta and SkinStore. Have you ever tried any skin care peels? That sounds nice. I do love my AHAs and BHAs, but having another option is always great. Sounds like a keeper! I hate having to wait in between applications though, but I guess that for a peeling to really work you have no other choice. You always show us interesting products/brands. I liked that it had the pump. Good that it worked for your skin. Have a nice week, Rowena! This product sounds like a great option if you cannot make it to a spa do a facial spa at home. It sounds great, I would like to try this peel!!! This does sound lovely! I love when lotions and things leave me skin feeling so smooth! This sounds great. I'd definitely try it! A gentle and effective peel - yes please! I've never tried it! and I do have to! I have never tried anything from this brand but reading your reviews on it has prompted me to make a list of their products to try and this will be included. Great review, Rowena! Rowena, you know I love a good product. And I'm with you, more jarred products should be packaged this way. It really helps. I will definitely have to check out this product. This sounds amazing! I love anything that makes my face feel soft and youthful all over again! This sounds wonderful! I love products that make skin feel soft and lightens sun spots...great find! This peel sounds amazing. I'm happy to hear that it does wonders for your skin and that it is also very gentle and not drying (as one might expect because it is an acid peel). Sometimes weather changes can make our skin feel stressed (and it is not fun when that stress starts showing) but I'm sure that you have some lovely memories from Curacao....skin will get used to the change in weather, sometimes it just needs a few days...especially as the whole world seems to be experiencing a mild Winter. It has been strangely warm lately, right? Here one can literally walk without a jacket when the sun is shining. Great to read that you are happy with this cream /peel! I need to pay attention to my skincare during my upcoming trip to California! I don't do peels very often, but this sounds like a great one to try! No I don't do peels b/c of all the reasons you mentioned and I was doing retinol but recently read that it can thin your skin overtime so it may not be the best to use now, so something like this could be a nice alternative. Wow this really sounds amazing. I've never done peels myself because I'm too scared of them. I've recently started using Exfolikate by Kate Somerville and have been pretty impressed with it. I have never used any acid peel product before; this does sound interesting. So glad it worked Rowena! It sounds like it's great when needed and gets the job done. This sounds so good, thank you for the tip, out looking for a peel so this was just in time as well! This sounds so good I'm considering giving it a try! I've never tried skin care peels. I'm sure the clear gel has also a great cooling effect. I'm always impressed of light consistences like that they have such a huge impact. Merry Christmas and a Happy New Year, Rowena!